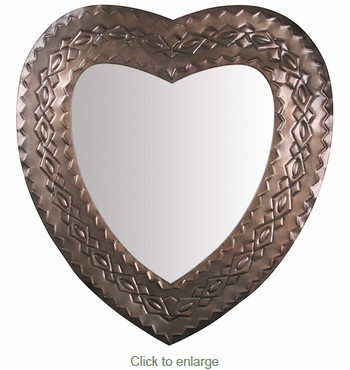 This unique heart shaped aged tin mirror is a perfect accent for your bedroom or hallway and will complement your rustic d�cor. Mirrors can illuminate and add visual interest in any space. All of our Mexican mirrors are handmade by talented metal craft artisans in Mexico. Expect some variations in color, design and size. This mirror hangs vertically.